Whether they’re helping residents enjoy a game of bingo or sitting down for a one-to-one conversation, volunteers are an integral part of the fabric of Pleasant Meadow Manor. Chris Garden, life enrichment co-ordinator, tells The OMNIway that volunteers have a huge impact on the culture at the 61-bed Norwood long-term care home. With their contributions in mind, Pleasant Meadow Manor hosted a volunteer appreciation tea April 18 for the men and women who offer their time and efforts to ultimately enrich quality of life for the home’s residents. Thirteen of the home’s approximately 20 volunteers attended the tea and enjoyed refreshments, fruit and sweets. Residents gifted volunteers hand soap and handprint cut-outs thanking them for lending a hand. Some of Pleasant Meadow Manor’s volunteers have been contributing to the home for two decades. That’s pretty special and a benefit of being located in a small, tight-knit community like Norwood. Chris says there are relationships and connections that extend beyond the home and into the community with community members becoming volunteers to support a friend and sometimes volunteers later becoming residents. In addition to the bingo and one-on-one time with residents, volunteers help with outings and special events, tend to the gardens and contribute to Bible study sessions. “It’s huge,” says Chris about the mark the men and women make on the home. April 15-21 was National Volunteer Week 2018. The week is marked by events nationwide that celebrate volunteers and all they do to enrich the lives of others. This year marked the 77th National Volunteer Week. 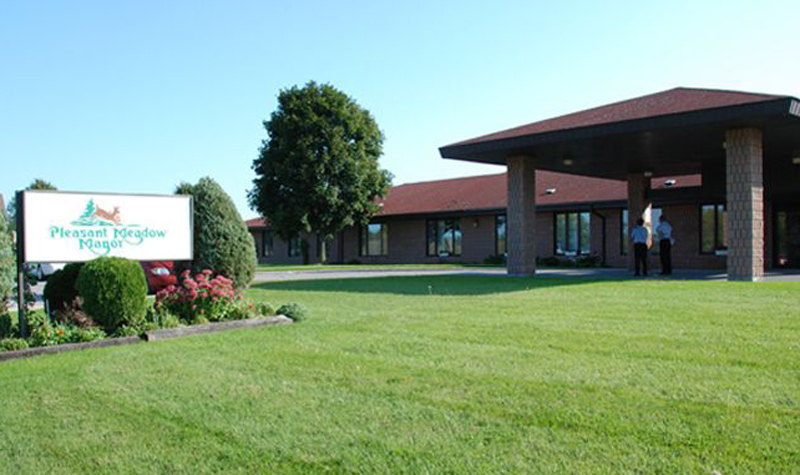 Anyone interested in volunteering at an OMNI Health Care long-term care home can call 1-705-748-6631 for more information. If you have a story you would like to share with The OMNIway, please contact the newsroom at e-mail deron(at)axiomnews.com. If you have feedback on this story, please call the newsroom at e-mail deron(at)axiomnews.com. PETERBOROUGH, Ont. – Four weeks into her seven-week placement at Riverview Manor, Fleming College occupational therapy assistant and physiotherapy assistant (OP/PT) student Jeel Patel says she’s decided she wants to work with long-term care home residents once she completes her program in June. From the man who clears the dishes after a meal to the woman who hosts a small friendship circle, Willows Estate views its volunteers as integral members of the care team. PETERBOROUGH, Ont. – Riverview Manor registered practical nurse (RPN) Carly Kenny says she applied for a position on the Peterborough long-term care home’s Behavioural Supports Ontario (BSO) team nine months ago because she saw opportunities to use her skills to enhance the quality of life for residents living with dementia. PETERBOROUGH, Ont. – OMNI Health Care president and CEO Patrick McCarthy says the organization is pleased with the announcement in the 2019-20 budget that the Ontario government will be committing $1.75 billion in annual funding over the next five years to support 30,000 new and upgraded beds. However, funding levels will need to match rising construction, utility, maintenance and property costs as well as increasing municipal tax burdens that arise as a result of redevelopment, he adds. PETERBOROUGH, Ont. – Since joining the Behavioural Supports Ontario (BSO) team at Riverview Manor, personal support worker (PSW) Nicole Munro says the most important thing she has learned is how to better provide resident-centred care. Country Terrace has been approved by the Ministry of Health and Long-Term Care to provide in-home peritoneal dialysis to residents at the Komoka long-term care home who are living with renal failure in an effort to relieve stress on the health-care system and improve quality of life for people by avoiding hospital transfers. When her father moved into Frost Manor in July, Helene Waddell says she immediately sensed the warmth and love that staff members at the Lindsay long-term care home have for residents. She also felt the need to help, so Helene quickly began visiting with other residents when she was at Frost to see her dad.